Unicorn (Russian: Единорог, Yedinorog, 'unicorn') is the name of an 18th- and 19th-century Russian cannon, a type of muzzle-loading howitzer, devised in 1757 by M.W. Danilov and S.A. Martynov and accepted by artillery commander, general Peter Ivanovich Shuvalov. The unicorn was a hybrid between the howitzers and guns of the era (a gun-howitzer), with a longer barrel than contemporary howitzers, giving projectiles a flatter trajectory, but longer range. Similar to the howitzers, they had a powder chamber of smaller diameter than the gun caliber, but whereas a howitzer's chamber was cylindrical, a unicorn's was conical, with its base diameter the same as the gun bore. The conical chamber was easier to load and facilitated the placement of the projectile perfectly in the center of the barrel. 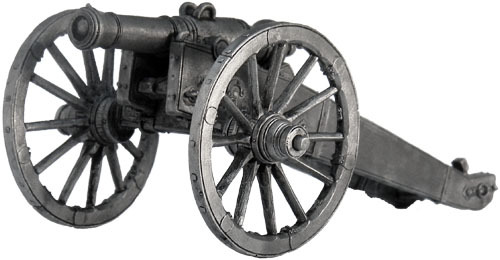 Licornes were able to fire both the solid shot used for cannons and howitzer shells, as well as grapeshot and canister. The name comes from unicorn-shaped handles on the barrel of the guns. After 1805, the Russian army used 2-, 10- and 18-pounder unicorns. A light foot artillery company consisted of four 10-pounder unicorns, four light and four medium 6-pounder guns; a heavy artillery company had four light and four heavy 12-pounder guns and four 18- and two 2-pounder unicorns. Six light 6-pounder guns and six 10-pounder unicorns made a company of horse artillery. Unicorns were usually deployed on the flanks of the batteries. This arrangement is now usually called the "System of 1805", and was largely devised by Aleksey Arakcheyev, after the lessons learned at the Battle of Austerlitz, where Russian artillery had performed poorly. (In the System of 1805, the 2-pounder Licorne is sometimes referred to as a 3-pounder, and the 18-pounder as a 20-pounder).